The few recent night dives I did with the ProDive crew took me usually to Oak Park or close by, and this week it was not different. Oak Park is a dive site I can dive many times without getting bored though, it offers so many possibilities! More by accident than planned we chose to follow the ledge taking off the main wall not too far into the dive, and that’s where we spent our time until we had to return due to a leaky Octopus and consequently considerable air loss. I love the small overhangs on the ledge, incredible what kind of critters are hiding there during the night. 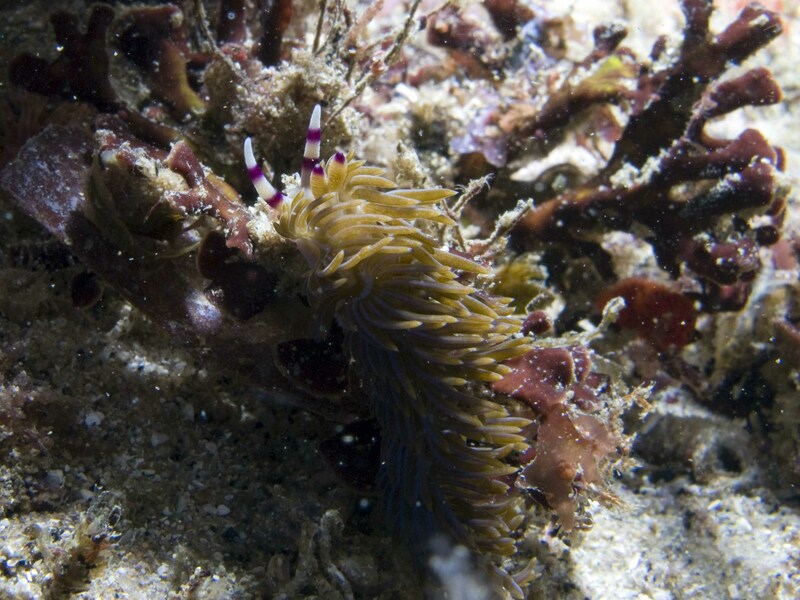 For the first time I also saw a blue dragon at Oak Park – a bit irritating though, as usually I don’t see any nudibranchs during night dives. In terms of photography there’s not much to mention. It was only my eigth or nineth shot (trying to get a cruising PJ shark into focus…) when my strobe run out of battery – my fix of twisting the japanese battery charger with a set of pliers has apparently not worked 100% yet :-). This entry was posted on September 18, 2008 at 11:12 pm and is filed under Divelog, Diving in Sydney. You can follow any responses to this entry through the RSS 2.0 feed. You can leave a response, or trackback from your own site.